Optional parameter is one of the good feature of C# language, this feature allow developer to write the code with default of parameters in case user not supplying input. Lets take an example to understand how it works. Here in the example I have created a class called MyClass and constructor with two parameters FirstName and LastName. Note*: For first name and last name, I have added the private keyword against the set accessor because I don’t want to allow it to be set from outside the class. This also another way to make a property readonly from out side the class but read / write from same class. Lets test the above optional parameter example using below code. You will get the below result. As we know, memory allocation and data store in memory done in two different ways when we create the object of datatype. One is data store and assigned to object variable in memory when we create it using value type data type (By Value). Second way is when we create the object of a class variable then that abject points to the memory location (By Reference). Object created using by reference option can have null value (like Class Object). The object created using by Value cannot have null value. When we compile this code compiler generates the below error message. But, there is situation where we need to pass the null values while inserting data for this data type. This can be achieve using the below code. The above code (‘?’ with datatype) will allow us to create an object of int data type and assign null value to it. Most of the time we get confused about the string and String class in C#. Technically, there is no difference between string and String. string is the Alias for the System.String class. It is just a coding guideline. Microsoft recommended coding style says that, use the string whenever we are creating object of string data type and use String class whenever we want to access the functions of the string class. Below shown is the very simple and easiest code example to serialize and deserialize the class object using XmlSerializer. //Assuming doc is an XML document containing a serialized object and objType is a System.Type set to the type of the object. Many times question came in our mind and we got confused about whether we can perform the data manipulation operations on views or not. The answer to this question is, it depends on how we have created the views. Let’s take a simple example to understand it. Now create the view on employee table as shown below and try to insert the value using it. 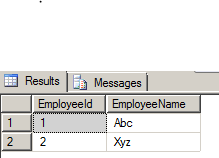 As you can see, there is one record in employee2 table which we have inserted using insert statement on table. We have created view vw_employee2 on employee2 table with filter on employeeid 2. Now try to insert the record for employee id 2 first and check the result. As you can see, data inserted successfully in table. Now try to insert the record in employee2 table using view for employeeid 1. The attempted insert or update failed because the target view either specifies WITH CHECK OPTION or spans a view that specifies WITH CHECK OPTION and one or more rows resulting from the operation did not qualify under the CHECK OPTION constraint. Summary: Yes we can perform the DML operation on View but it depends on how we have created it. Below is the simple code example to export the DataSet into an Excel using ClosedXML dll. Below is the code to read the data from data table using linq. You cannot directly use the data table as you use collection object and specify the linq expression. For data table you need to convert its content which represent collection using AsEnumerable() method.